The poems in this collection are easy to love–accessible, plainspoken, yet rich in depth and meaning. As earnest as they are lilting, these poems reach out for beauty and truth–the core of Art. And they are often playful and amusing, as is evident from such poems as “Hey Pretty Kitty,” “Renaissance Man,” or “Ode to a Pearly Naut.” Nor does this book slight the darker side of life, as expressed metaphorically in “To a Lost Friend,” or more starkly in “Delirium.” The visual appeal of the photo–art in this book is an ideal match for the musicality of the poems. Among the photos, you may be particularly struck by “Radiant Autumn” on the front cover, or the glowing “Golden Mountain” on the back. And what a delightful little gift this book is for your friends, relatives, and all those you love! I am one that enjoys poetry and I have to say that placing photos with these poems definitely enhanced my enjoyment. First, let me say that the poems could stand alone, touching the very core of each subject in different ways. Some were gentle, like a bubbling brook, others were telling in soft whispers, while others breathed forth the sorrow and sadness of living and dying. Each could stand alone, yet seemed to wrap themselves together and merge into a story of life. I loved the photos, especially the one ‘My Dog Shad,’ and the poem that followed, especially the last line. I had to laugh. However, every picture told a story of its own, a piece of life in our ever changing world. They made you pause and think, if just for a moment, and at times they made me giggle. I especially liked “She Stoops to Peruse”…too funny. All in all this was a book that I truly enjoyed reading and ‘seeing’ and I am pleased to recommend it. 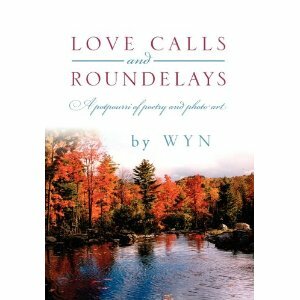 LOVE CALLS AND ROUNDELAYS is a colorful assortment of poetry by Wyn. From the stars, to the ocean, to the universe itself, this collection reaches a broad expanse of feeling and depth into the writer’s soul. The gift of summer is expounded on with its visionary scenes of countryside and fertility, while yet another sonnet delivers the sparkling wonders of winter with its crisp air and interfacing light. Emotions are touched, sorrows and tears, while other lyrics proclaim hope and inspiration in the simple pleasure of just living and the hope of a new tomorrow. LOVE CALLS AND ROUNDELAYS by author Irwin Shishko is a wonderful collection of poetry by a gifted author, who can compose sonnets about the simple housecat to a more broad exchange of God and the universe. Wyn holds nothing back as he candidly reflects on his emotions and visions in this uplifting collection. The book is set off by a variety of black and white photographic pictures stemming from statues, animals, buildings and people in various displays. The photos are visually appealing and worth a second look. I truly enjoyed reading this wonderful collection – especially favoring Wintersong and also Ocean Song. One gets the sense that the author has traveled and seen a lot in his years and has a keen insight into the human spirit. The author is truly gifted with a pondering eye and I enjoyed this wonderful collection of poems. Well done. I have never been able to really get ” into ” poetry but this little book did it for me. What a wonderful introduction to poetry it turned out to be for me.I was amazed how easily I was drawn into the sentiments many of these poems conveyed and how readily I identified with many of the far ranging subjects they covered. Great book and great gift for the Holidays.